When Indian ODI skipper Mahendra Singh Dhoni crossed 22 run mark against the Kiwis in the third ODI at Mohali, he reached yet another milestone in his glittering career. Dhoni reached the milestone in his typical agressive fashion by tonking Kiwi spinner Mitchell Santner for a big six. Dhoni only became the third wicket-keeper batsman in ODI cricket to score 9000 runs as a designate wicket-keeper. Dhoni entered an elite club of wicket-keeper batsmen comprising of former Australian great Adam Gilchrist and Sri Lankan legendary batsman Kumara Sangakarra. He is now the 3rd wicketkeeper-batsman after Kumara Sangakarra (13341 runs) and Adam Gilchrist (9410 runs) to score 9000 ODI runs. With 124 sixes, he also surpassed Ricky Ponting's (123) record of hitting most sixes as a captain. MS Dhoni has also hit the most number of sixes by an Indian in ODI cricket. 'Mahi' has hit 196 sixes to surpass the previous record of 195 in the name of the 'Little Master' Sachin Tendulkar. Down the years, India had some great gloves-man like Syed Kirmani, Kiran More and Nayan Mongia who excelled with their keeping skills but MS Dhoni refined the role of a wicket-keeper in ODI set up of Indian cricket. Here came a man who brought in the very concept of a wicket-keeper batsman, a keeper who could contribute with valuable knocks down the order. In purist terms, Dhoni's batting is 'unorthodox yet effective'. All through his ODI career, he has accumulated runs at a brisk pace and has the requisite stroke-play to lend impetus to the innings towards the end. Dhoni was naturally athletic courtesy his exploits in soccer from a very young age and is known to be a good runner between the wickets. Dhoni is predominantly a bottom hand player and uses his brute power from his iron like forearms for tonking those lusty boundaries. Be it the 'Helicopter Swirl' or the characteristic slog to the deep mid-wicket, he has invented shots of his own all through his career, much to the fan's delight. On the mental side, he is extremely calm and composed and feels unnerved by any sort of pressure while chasing down big totals. Coming from a very humble background and small town in Eastern India, the man made giant strides into international cricket by leading India to the T-20 World title in 2007. His exploits in T-20 cricket gave him an entry into the ODI arena. After a rather sluggish start to his international career, Dhoni announced himself on the big stage by scoring two scintillating centuries against Pakistan and Sri-Lanka. The world knew that they were in for something spectacular. It comes as no surprise that Dhoni idolized Aussie legendary wicket-keeper Adam Gilchrist as his childhood hero. 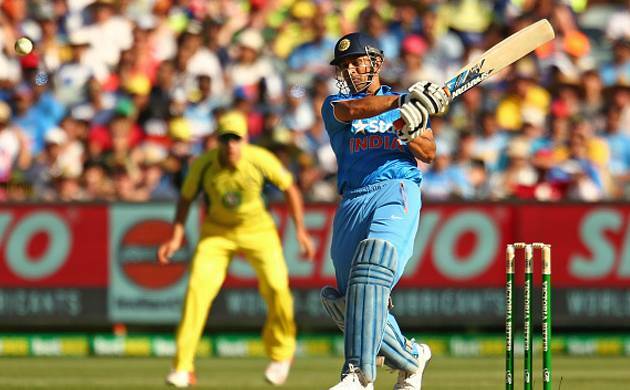 Dhoni styled his game on his idol Adam Gilchrist's destructive yet entertaining stroke-play. Dhoni has made a mark in ODI cricket with his dashing stroke-play and brutal hitting. He is known to have raw power and wields an array of destructive innings to take the Indian team more often than not. He has made a reputation of sorts of becoming arguably the 'best finisher' in the limited overs format for India. Dhoni mastered the ability of pacing his innings till the very end and finishes off games with a flurry of boundaries at the very last, keeping the Indian fans at the edge of the seat. MS Dhoni has indeed been a great servant for Indian cricket. Dhoni's name shall stand tall among great wicket-keeper batsman in the history of ODI cricket.